Solar bronze-tinted windshield features traditional styling and 2-inch height adjustment. Sized to provide upper body wind protection. Height is measured from top of headlight cut-out to top of windshield. Replacement windshield glass is available if needed. Both sizes shown in photo for height comparison. 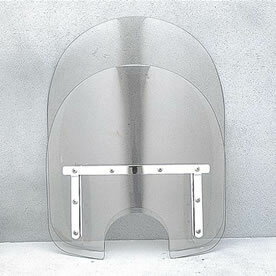 Tall V-Star 1100 Custom Windshield 21 1/4"
Short V-Star 1100 Custom Windshield 16 1/4"